Maintain Safety Refresher- Available Now! This training is 100% online and can be completed in your own time. When you’ve successfully finished your training, you can download an Interim Certificate of Completion which is valid for 30 days, during which time we will send you your nationally recognised Statement of Attainment. This course is the annual refresher recommended to maintain currency of this qualification (in particular Safety & Survival techniques). If you are looking for the full qualification, please click here. 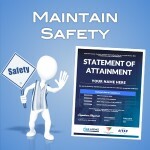 This unit covers the competency to recognise potential health and safety risks and take action to eliminate or control those risks at incident scenes, to prevent injury to self, other personnel or members of the public. Recommended for: This competency can be provided to and is suitable for; Fire Authorities, SES, Local Government Agencies, and/or contractors supporting those agencies during an Incident Scene or as part of the recovery process of a declared Incident scene. Initial Qualification – Coming Soon! 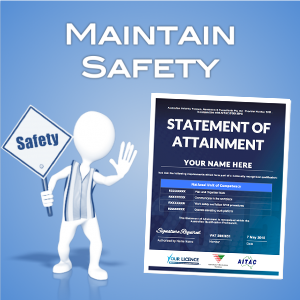 Your Licence is now offering both the qualification and refresher courses for the Maintain Safety at Incident Scene discipline. The initial qualification course is 4 hours, and covers the competency to recognise potential health and safety risks and take action to eliminate or control those risks at incident scenes, to prevent injury to self, other personnel or members of the public. Our annual refresher course is recommended to maintain currency of this qualification (in particular Safety & Survival techniques). Our version of this training is 100% online and can be done in your own time. Once successfully completed, you will receive a nationally recognised Certificate of Completion. 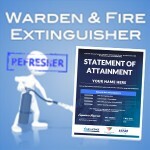 Initial Qualification & Refresher – Coming Soon! 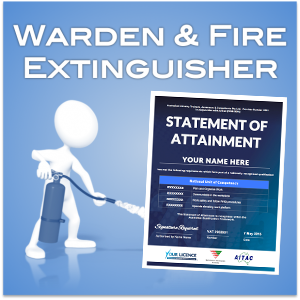 We are also now offering both the initial qualification and refresher courses for the Warden & Fire Extinguishers Training. The initial qualification is 4 hours and covers the requirements of AS 3745 – 2010 for Wardens that have been assigned the responsibilities to contain, control or eliminate the emergency using first attack emergency response equipment (Fire Extinguishers), whilst working within a command, control and coordinate structure (ECO). Our annual refresher course is recommended to maintain currency of this qualification. Once successfully completed, you will receive a nationally recognised Certificate of Completion. Recommended for: This competency is suitable for Workplace Occupants (employee’s) of Facilities (buildings) that are required to implement the emergency response procedures of the Emergency Control Organisation. Public Safety Courses Coming Soon!